Every wine connoisseur knows the importance of having a good display case to hold and show off their favorite bottles. Save space and stay organized with an X-design 16 bottle stackable wine rack from HomCom. Keep your wine tasting bold and exquisite by storing the bottles horizontally, which keeps the cork moist and swelled to limit unwanted air contact. The compact design allows you to store your wine in any free nook, it is also modular so you can stack them and increase storage as your collection grows. The dark coffee brown pine wood beams of this wine storage cube evoke a contemporary, natural feeling that is perfect for any decor. This HomCom tabletop wine rack is a must-have for those looking to start their first wine collection or for more experienced collectors. Whether you are just looking for a place to put your wine until you drink it, or for permanent storage of your collection, this natural wine bottle organizer box is an excellent choice. ✔ VERSATILE DESIGN: With a modern sophisticated design, this wine storage cube is ideal for organizing and displaying your favorite wine in any indoor space, such as the kitchen counter, dining room, or wine cellar. The beautiful dark brown finish wood beams of this wine cabinet evoke an elegant, natural feeling that is perfect for any home. 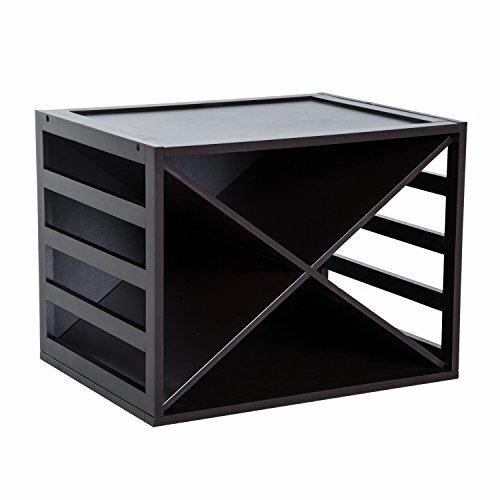 ✔ DURABLE X-DESIGN DIVIDERS: This organizer includes 4 sections with an X-divider that is constructed of pine and engineered wood helping make it scratch and chip resistant. This tabletop wine rack is sturdy enough to store and protect your wine collection. ✔ LARGE HOLDING CAPACITY: The wine bottle organizer box can store up to 16 bottles of wine, spirits, or beverages creating ease of access in an aesthetically pleasing stackable box. ✔ STORES FOR PEAK FLAVOR: The horizontal wine storage system allows the cork to remain moist and swelled which limits unwanted air contact. ✔ SEAMLESS INTEGRATION: Use this stackable wine rack by itself on the countertop or stack and expand your wine cellar with multiple racks as your collection grows. Freestanding racks for bottles are versatile to fit any space and are ideal for use with additional HomCom wine glass racks to help organize your beverages.